U-values measure how effective a material is an insulator. The lower the U-Value is, the less heat loss and the more insulation the material provides. Take a look at our u-value chart for further information. Low-e glass has an extremely thin, clear coating – that reflects heat. When the heat inside a building tries to escape outside during the colder months, the low-e coating reflects the heat back inside, reducing radiant heat loss through the glass. This process is put in reverse during the warmer months. Ultimately, low-e glass can improve the insulation of a home from external temperatures in any climate. What parts of Scotland do you deliver to? We deliver to Ayrshire, Dumfries and Galloway, Glasgow, Paisley, Lanarkshire, Falkirk and Stirling. Do you recycle all parts of old glass? Clean cullet (off cuts of glass which are too small to be cut down or damaged glass which has not gone through the double glazed manufacturing process) is 100% collected for recycling purposes. We offer a 5 year guarantee on all double/triple glazed units against breakdown/failure. Will the designs in your brochure match my glass? The designs in our decorative brochures are guidance only and will not always be the exact finish of your product. For more information please contact us on 01294 270903. Can I buy my glass direct? 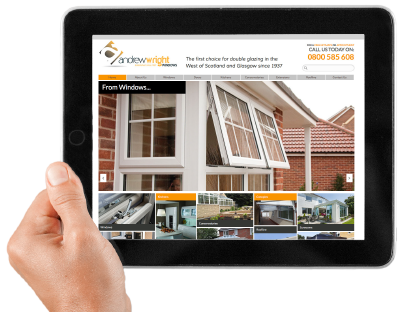 Will I save money on my heating bills by installing sealed units from Andrew Wright Glass? Yes, our double glazed and triple glazed units achieve superb thermal performance with the lowest u-values and A+ energy rating. We offer the best in energy efficiency and comfort in the home. Is the Argon gas used in sealed units safe? Yes. Argon is a static, colourless, neutral, non-hazardous gas that can be used to fill the cavity between the two panes of glass. This type of gas is six times stronger than normal air and improves the thermal performance of your sealed unit by significantly slowing down heat loss.